Jacob Dooijewaard travelled to Norway almost every summer, where he would stay at the house of his good friend and painter William Singer. The surroundings, the nature and the bright light were of important inspiration to Dooijewaard. His palette had become lighter under the influence of the climate and the different light, the heavy warm colours of the Low Countries giving way to soft, cool and serene hues. Dooijewaard would look for new mediums to portray his Norwegian experiences and pointillist techniques offered him natural possibilities in this new environment. 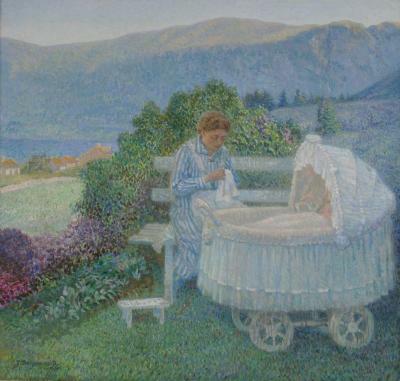 In this painting, which Dooijewaard painted in 1930, he depicted a nanny sitting on a bench with a baby carriage in front of her. She is completely focused on the activity of sewing or embroidering the white cloth she holds in her hands. The surrounding nature breathes a realm of serenity. The clear blue sky, the beautiful green cliffs of the fjord, the sleeping baby and the concentrated nanny: everything points to a peaceful environment. Dooijewaard evidently succeeded in representing the pleasant feelings he had about Norway in ‘Nanny at the Fjord’. 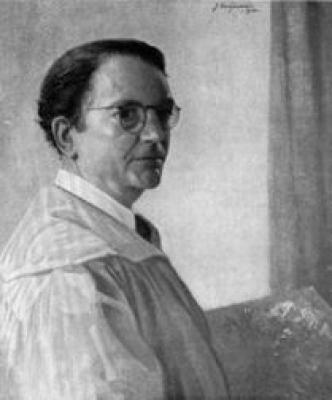 As a young child Jacob (Jaap) Dooijewaard frequently hung around his father’s workshop, grinding colours and doing small tasks, and in the process developing his interest in the profession of painting. After finishing his artistic studies in Amsterdam he began recording his impressions of the city using a spontaneous brushstroke: the Amsterdam canals, the streets, and the grey skies han . . .